When discussing marijuana potency, we are talking about the levels of THC, marijuana’s psychoactive ingredient. THC levels in marijuana have changed dramatically since the days of Woodstock when THC levels ranged from 1 to 3%. According to data published in the National Drug Control Strategy, the potency of marijuana has more than tripled since the mid-1990s. In Colorado, the average potency of smoked marijuana is over 17% and average potency of marijuana concentrates is 62% with some samples recorded at 95%. 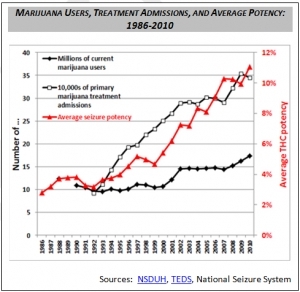 The rise in marijuana potency has coincided with a rise in marijuana treatment admission rates as shown on the below chart. High potency marijuana has also been tied to an increase in hospital admission rates and calls to poison centers. According to a recent study in the Journal of Toxicological Sciences, marijuana concentrates may contain pesticides and toxic solvents which remain as residue from the manufacturing process. The study found that over 80% of the concentrates tested in the study were found to contain residual solvents, including isopentane, butane, heptane, propane, and other solvents. Additionally, nearly 40% of the concentrate samples contained pesticides. The most common was paclobutrazol, a plant growth regulator, and bifenthrin and myclobutanil were also detected. Another study found “medical” marijuana samples collected in Los Angeles contained pesticide residues at levels 1600 times the legal digestible amount.